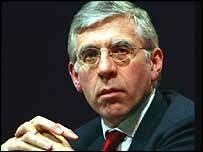 Straw said "dodgy dossier" was "a complete Horlicks"
Foreign Secretary Jack Straw says he never saw the controversial "dodgy dossier" about Iraq's alleged weapons of mass destruction before it was published in February. Mr Straw said the dossier was an "embarrassment" for the government and was commissioned by Downing Street communications director Alastair Campbell. He apologised to the student whose thesis was used as the basis of the "dodgy dossier", during questions from the Commons foreign affairs select committee. And he defended the way the reports were made public, amid claims that Number 10 hyped up intelligence about Iraqi weapons. He admitted the whole "dodgy dossier" affair was "a complete Horlicks". His remarks will increase the pressure on Mr Campbell, who goes before the committee on Wednesday. Mr Straw said intelligence officials had to his knowledge not complained to the government about its first dossier, released last September, about Iraq's alleged weapons programmes. And he dismissed suggestions that the government had sold the war to the British people on a false premise. "Some of our critics have tried to put into our mouths words and criteria we never ever used," Mr Straw said. "We did not use the words 'immediate' or 'imminent'... We did not use that because plainly the evidence did not justify that. We did say there was a 'current and serious' threat and I stand by that completely." BBC defence correspondent Andrew Gilligan's reported last month that a senior British official had told him that the government's dossier on Iraq's weapons programme had been "sexed up" at Downing Street's request. The alleged changes included giving more prominence to the claim that Iraq had weapons of mass destruction which could be launched within 45 minutes. Mr Straw said the 45 minutes claim was being given much more prominence now than had happened when the dossier was published last September. He branded as "completely untrue" the claims that Number 10 had interfered, saying the Joint Intelligence Committee had endorsed the dossier. "There was never any request for the so-called 'sexing up' of either dossier, certainly not of the first dossier," said Mr Straw. He said he had no doubts over the accuracy of anything in the September dossier. "Some of what is in here has been proved by events, none of it has been disproved," he argued. The foreign secretary insisted there was "overwhelming undisputed evidence" to justify action against Iraq, pointing to UN inspection reports. He also said British sources had not been involved in information, later found to be based on forged documents, about Iraq trying to buy uranium in Africa. Mr Straw said it was "completely unsatisfactory" that the "dodgy dossier" had not been checked by intelligence officials. Despite the problems, he argued the accuracy of the dossier, which was intended more as a "briefing paper" for journalists, was "not seriously at issue". "Of course it has been an embarrassment to the government and lessons have been learnt," Mr Straw went on. He said there had been a "series of innocent errors" with nothing corrupt about it at all. An international survey group is now looking for weapons evidence in Iraq and Mr Straw said findings would be made public. But he argued the Iraqi regime had been "adept" at cleaning up units used for producing chemical and biological agents. Because of fears that Saddam Hussein was still alive and free, people were intimidated against offering information over the weapons programmes, he added. Two of Mr Straw's former cabinet colleagues, Clare Short and Robin Cook, have already said the public were misled. Shadow defence secretary Bernard Jenkin said the "corruption" of important material in the "dodgy dossier" was the result of allowing political appointee Mr Campbell to give orders to civil servants. Liberal Democrat foreign affairs spokesman Menzies Campbell said there was a sense of "not me guv" which would make Alastair Campbell's questions session something like "high noon". He said the intensity of Mr Blair's speeches had left nobody doubting the immediacy of going to war, despite Mr Straw's insistence the words "immediate" or "imminent" were not used about the Iraqi threat. 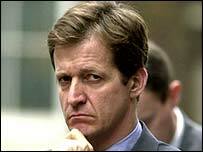 "The chances of Alistair Campbell clearing his name have been undermined by the Foreign Secretary"